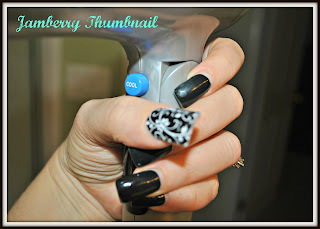 Everything for Ana: 6000 Fan Giveaway: Day 4 Jamberry Nail Shields with Susan D!! 6000 Fan Giveaway: Day 4 Jamberry Nail Shields with Susan D!! I am so excited to bring you today's giveaway in my ongoing celebration. Today's Giveaway is sponsored by a personal friend of mine, a lovely local Mom and a member of our playgroup who works with Jamberry Nails, Miss Susan D.
And after...isnt it sooooo pretty?? Or maybe the snowflakes...love the blue and white. Want to know more about Jamberry? Right now there is free shipping on orders over 45 dollars through November. That will buy you 4 sheets with the buy 3 get 1 free deal. You can host a party for your family and friends and earn free shields!! Jamberries are formaldehyde free, contain no harsh chemicals and are even vegan friendly. Best of all they last for up to 2 weeks on fingers and up to 6 weeks on toes with no chipping etc. How fun!!! I love the red sparkle. I really love the snowflakes. They would be perfect this time of year. Thanks for the opportunity! I love the blue and white snowflakes. So hard to decide but I think I would pick the Raspberry Sparkle. I would get the light string/red pinstripe from Jamberry Juniors. My girls would love those! I would get the snowflakes! Ornaments would be good for the season. I would choose the Purple Primrose.